They say you never forget how to ride a bike. On May 18th, plenty of people will discover if that old maxim is true. Bike to Work Day is a yearly holiday celebrating – you may have guessed – the idea of riding your bike to work. People often revel in riding their bike, because it provides physical exercise, a reduced carbon footprint, and helps save money on gas. You probably haven’t taken your hot rod out for a spin in a month or two. That’s why we put together some pre-biking breakdowns to help you prepare for the commute to work. Who knows; you might want to turn this one off holiday into a regular routine. Because there’s no defensive drivers course online for people who ride bikes, consider this to be your crash course in defensive bike riding. These rules will ensure bikers stay safe and out of the way of speeding 4-ton chunks of metal. Before riding your bike, ensure the tires are firm and filled with air. A deflated tire will run the risk of bursting during your commute. At the very least, it will keep you sluggish and slow when riding to work. Dust the dirt off that bereaved bike pump and inflate those tires. Come to think of it, this is age-old bike advice that will never tire you out. You’re not driving a car, so you might need to change your route to work. Since you’re riding your bike, there’s probably a plethora of hidden, secret shortcuts that will cut your commute. These could be passages that you’ve completely ignored through the confines of your car. Take a moment to explore the best way to work on your new ride. You might come across buried treasure. Some people live a mile away from work. For others, that commute is upwards to 15 miles. If you find yourself spending an hour and a half on the road, make sure you pack a snack, such as granola, and carry a canister of water. The best kept biking secret is maintaining energy levels and staying hydrated. You can refill your canister with water from a roadside ditch! Helmets, knee pads, and gloves are accessories that will ensure your safety on the road. 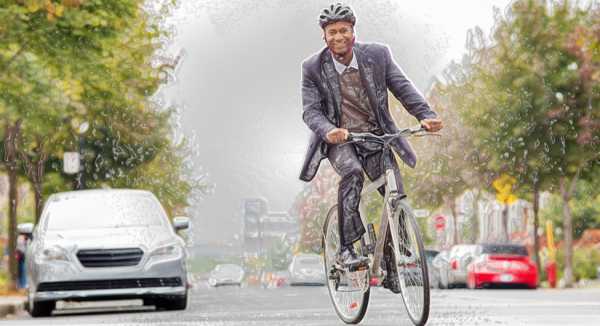 Protective products aren’t just recommended, but required, if you’re wanting to make the most out of Bike to Work Day. Also, don’t forget to purchase reflective lights to help drivers spot you when you’re commuting at night. Otherwise those long hours in the office will be the death of you. To prevent your bike from being stolen, tether it to a stationary object with a bike lock. The last thing you want is a stolen bike stranding you 15-miles from home. Staying at work when you don’t need to is never fun. Bikes don’t come with a key fob that will lock your doors. In fact, bikes don’t even have doors.